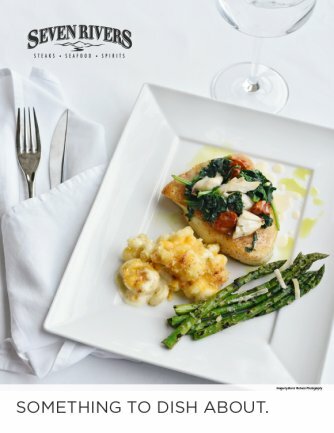 Seven Rivers fuses atmosphere, culinary craft, attentive service, and a great wine list to establish an amazing, authentic steakhouse experience. Our Chefs will thrill you from the exhibition kitchen where they deliver unique steak and seafood combinations. Featuring prime cuts, locally sourced organic vegetables and ingredients, and the secrets of Chefs who have traveled the world ... Seven Rivers Steaks Seafood Spirits invites you to spend an evening with us. 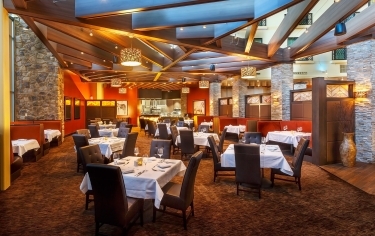 The atmosphere of our fine dining restaurant is designed to create the feel of an historic casino steakhouse. Our culinary experience - one of exquisite steak and seafood combinations - is matched by the exhibition kitchen and fine appointments throughout. Get ready to share an evening that is like no other in the Four Corners.